a bucket of cold water. A gauzy autumn morning. A drained sunrise. your sheet, bite back a sob. even though you already have one. hoping it doesn’t tip or catch on a corner. you can’t lift it. It’s too heavy. on the house parent’s lips, you can’t use your fingers. his hands with rope. Could do the same for signing. even though you’ve been here two weeks. hoping their words will clench before you. through the fibrous dormitory air. the words, as though they might bury you alive. spidery hands seeking to measure, seize, grasp, coax, convince. meant to ward you off. leaving a flinty taste in your mouth. into place, giving them enjambments, iambs, spondees. The teacher’s cleanshaven lips crisply emit the words. The teacher’s hand chops the air. your hands are bound & gagged. & tells you to sit down. encircles your hands, stifling your movements. You sign in quick tight motions, whisper your signs. marginal, little finger flicks to fill the silent gaps. from which an accent, a voice, might be formed. effect, like the hiccup of a lost soul. And their diction. The phrases they use. off the tongue. ‘Underibewatewy.’ Obtuse. You’d think they’re totally illiterate. They always forget whatever came before. ‘Again. Again!’ Their mouths goad, irritate. its grizzled snout nearly lifelike in shadow. in the walls of your mouth. The church is full of mottled light. adjust your clunky hearing aid. It’s like trying to trap echoes in a box. thankfully he has a mouth like a whale shark. speaking exercises that loosened Martin’s teeth. if a deaf person can properly receive the word of God. At night, you decide to become a saint. forming in your mind, you whisper with your hands. Adam Pottle’s writing explores the dynamic and philosophical aspects of Deafness and disability. His 2011 poetry collection Beautiful Mutants was shortlisted for two Saskatchewan Book Awards and the Acorn-Plantos Prize. 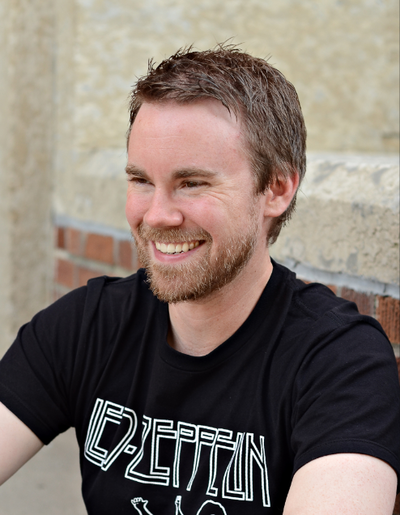 His 2013 novel Mantis Dreams: The Journal of Dr. Dexter Ripley won the 2014 Saskatoon Book Award, and his 2016 novella The Bus won the Ken Klonsky Award. The Bus was also shortlisted for two Saskatchewan Book Awards and the ReLit Award. He lives in Saskatoon.